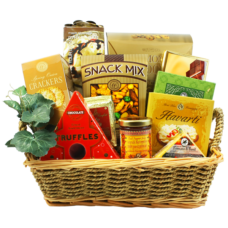 Our Cheese Gift Baskets Canada category contains baskets filled variety of gourmet cheeses. In particular we gathered cheeses for you from different countries. 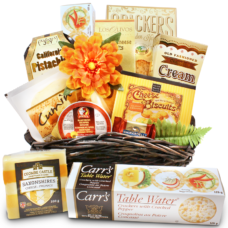 The award winner cheese pleasers are great additions besides the fresh fruits. 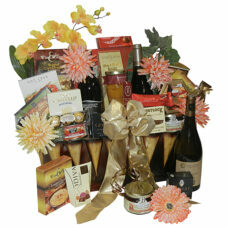 Fruit and wine jellies are fine compliments to our top of the line cheeses as well. Cheese holds many nutrients like calcium, protein, phosphorus, and zinc. Moreover they also contain vitamin A and vitamin B12 which are very valuable to a healthy lifestyle. A smart choice to add cheese products at least 3 servings of milk, cheese or yogurt each day to a healthy diet. 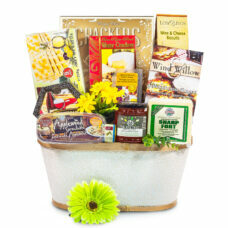 Choose from a nice variety of gift baskets that are filled with fine cheeses and gourmet delicacies. 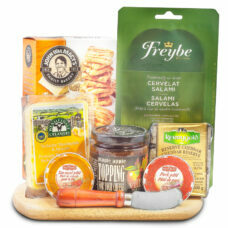 Makes a magnificent gift to all cheese lovers, foodies, gourmet lovers and anyone who loves taking a bite out of a tasteful cheese. 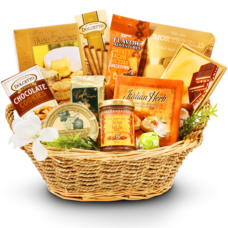 A luxurious gift basket with delectable gourmet Truffle cheese and other truffle related items. 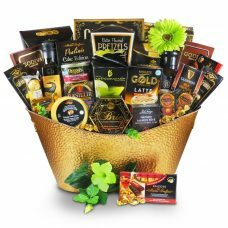 A luxurious gift basket with delectable gourmet Guinness chocolates, Bourbon smoked Gouda and more. 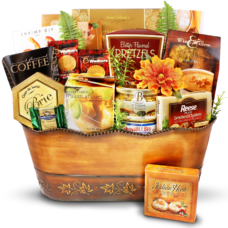 This distinctive basket is filled with an abundant selection of conventional favorites such as delicious Smoked Sausage, assorted specialty Cheese and gourmet Crackers and much, much more! 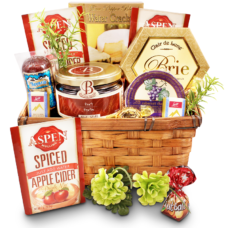 This distinctive basket is filled with an abundant selection of conventional favorites such as delicious assorted specialty Cheeses and gourmet Crackers and much, much more! 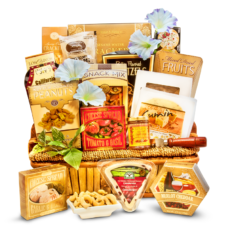 This distinctive basket is filled with an abundant selection of conventional favorites such as assorted specialty Cheeses, nuts, dried fruits, delicious dry Sausage, and gourmet Crackers and much more! In a very difficult time like this a Touch of Heaven Sent by you to the recipient will comfort them on this difficult day. This is how you can serve up some really good gourmet foods! 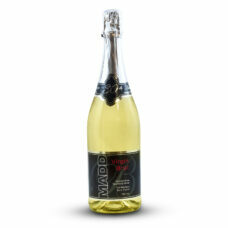 The finest wine and gourmet seafood will compliment this elegant gift. 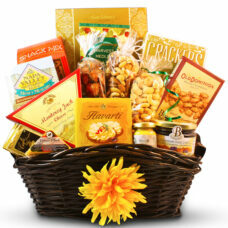 Send your Best wishes for a speedy recovery or a birthday with this rich assortment of gourmet indulgences. 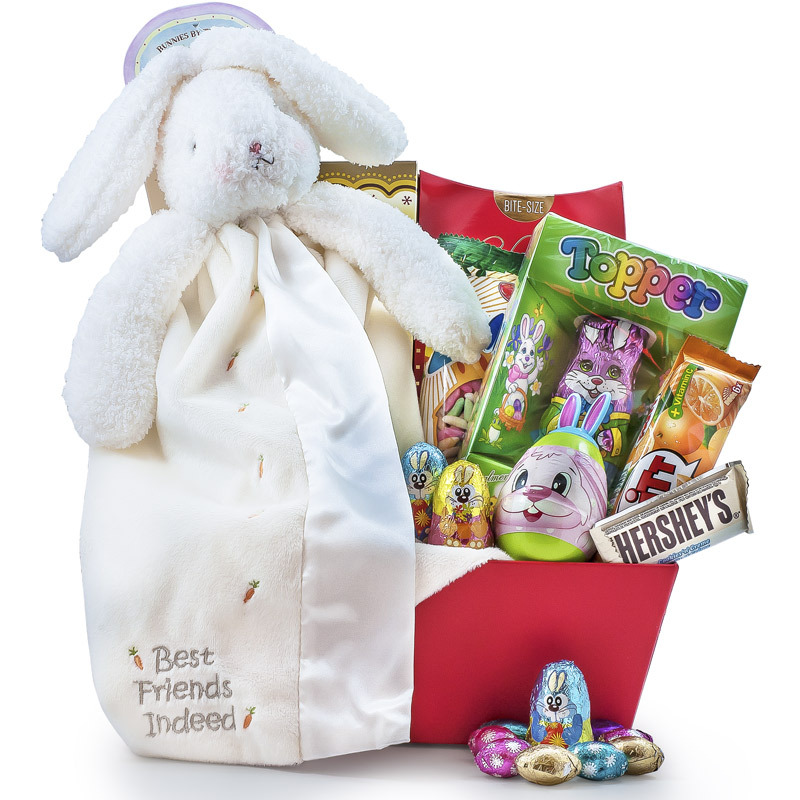 Perfect for the holidays, this bountiful gorgeous basket contains only the finest in gourmet foods and treats! 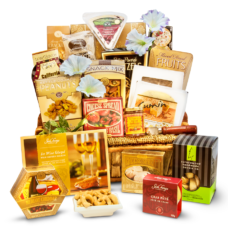 This gourmet gift offers a medley of mouthwatering cheeses, herb crackers, California pistachios, and cheese and wine biscuits. When you wish to send a thank you or a congratulation gift this pairing of amazing port wine jelly, sausage and cheeses will do a very good job impressing the recipients. 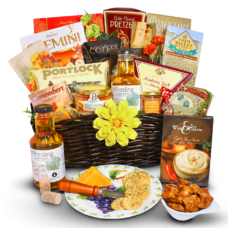 Wine Pleasers basket is designed to compliment a wine party, featuring french nailla coffe, Almond Biscotti, cheese bacon dip mix, cheese knife, porcelain plate, cheese spread and more! 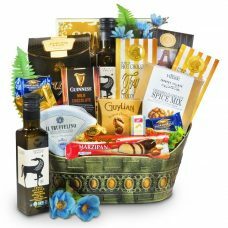 It is an ideal gift for Christmas, birthday gift or get well gift spilling over with gourmet English cheeses, olives, red pepper jelly and more. 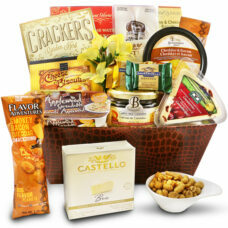 Cheese Lovers Favorite is the best way to describe this top of the line exquisite cheese gift basket. Send the best to your friends and family. 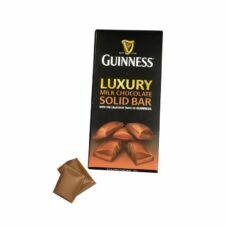 Ideal gift for a family occasion or for office party as a Thank you or congratulation gift with ready to eat treats.